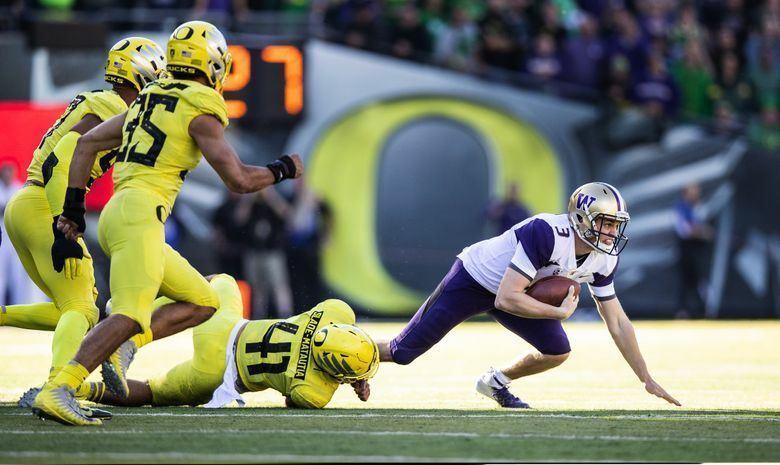 The Huskies' 30-27 loss was great for the rivalry with Oregon and the Pac-12, but it knocked them out of the driver's seat for the North and effectively ended their playoff hopes. Is it time to start questioning Chris Petersen’s big-game methods? Saturday’s game, the first overtime affair between the two schools, was great for the Washington-Oregon rivalry and great for the Pac-12 Conference. After nearly two decades of blowouts, going both ways, this rivalry needed a new life, and it got it. Both programs appear built to compete for Pac-12 North supremacy for the next several years. In the season opener at Auburn, the Huskies had four offensive linemen making their first start at their current position (with senior right tackle Kaleb McGary the only lineman returning at his position). That youth and that inexperience showed in particular at the end of that loss to Auburn, when crowd noise in Atlanta disrupted the snap count and confused the communication. The line has come a long way since. It might be the most improved unit on the entire roster this season. At Autzen Stadium on Saturday, in the most hostile environment they will play in, the Huskies had only one penalty on the O-line (a 5-yard false start on left tackle Jared Hilbers in the second quarter). The line allowed only one sack and helped the offense pile up 437 total yards — 6.2 yards per play and 16.2 yards per pass completion, both season highs against a Pac-12 opponent. The Browning-underperforms-in-the-big-game chatter proved, once again, to be overblown. The late drive Saturday — on the road against the Huskies’ biggest rival — should have been a defining moment for the senior QB. What else could he have done in that situation? In the second half? Running an offense that played much of the game without its top two running backs, Browning was about as good as he’s been in his career, all things considered. He put the ball where it needed to be, when it needed to be … until Chris Petersen took it away from him and put it on the left foot of a freshman walk-on kicker. Browning was 9 for 10 in the second half. He was 4 for 4 on the final drive of the fourth quarter, putting UW in position to win it. He did everything he was supposed to do in that situation, everything you would expect a senior QB of his stature to do. He did miss, and missed badly, on his only pass attempt in overtime, a high throw intended for Ty Jones in the end zone on third down. It never should have come to that. The Huskies should have ended it in regulation, should have put their trust in their senior QB to drive for the end zone in the final 30 seconds — with two timeouts to work with — or get the ball in better position for a young walk-on kicker trying for his first game-winning field goal. Not sure what else to say here that hasn’t already been said about Washington’s third-down defense, which ranks No. 10 in the Pac-12 and No. 118 nationally in allowing conference opponents to convert on 51-percent of third-down plays. (For context, USC ranks No. 1 vs. Pac-12 foes at 32 percent.) It was an issue against Penn State in the Fiesta Bowl; an issue against Auburn in the season opener; and an issue Saturday against Oregon. The Huskies’ lack of a consistent pass rush plays a role in that, certainly. Perhaps it’s instructive to look at Oregon’s third-and-11 play in overtime, a conversion that set up the Ducks’ game-winning touchdown run. The Huskies elected to rush just three and drop eight into coverage. Justin Herbert had a clean pocket to find Dillon Mitchell for a 17-yard gain. The Huskies have excelled in recent years at limiting opponents’ big plays, but in certain third-down situations the “soft” coverage clearly isn’t working. This is not an effort to pile on the walk-on redshirt freshman kicker. If Seattle football fans have learned anything the past year, it’s that kicking is unpredictable. More concerning for the Huskies should be the other areas on special teams, and the punt unit in particular. UW ranks dead last in the Pac-12 in punt-return yards allowed (24.4 per game, and 13.2 per return). Through seven games, the Huskies have allowed 13 returns; in 13 games last year, they allowed a total of 11 returns (with a 5.3-yard average on those returns). Some of that probably has to do with an undisclosed injury to junior punter Joel Whitford, but it feels deeper than that too. Is it time to start questioning Chris Petersen’s big-game methods? Late-game clock-management issues have surfaced before for Petersen (see: Arizona, 2014, a loss that remains a sore subject for the coach). Some have argued that it is “reasonable” to expect a college kicker to make a 37-yard field goal, as was the setup for Peyton Henry on Saturday in Eugene. Perhaps. But a coach in that moment needs to weigh all factors, and in that moment that kick was probably never better than a 50-50 proposition for the Huskies. Consider that Henry had never before attempted a kick of that magnitude, in that kind of charged environment, with all that was on the line. Consider, too, that until Saturday Henry’s longest field goal make for UW this season was from 31 yards. And consider Petersen’s history with kickers in those situations (hint: It’s far from perfect.) So what’s “reasonable” here, really? With two timeouts to work with, 35 seconds on the clock, facing a third-and-one, the Huskies could easily have run one more play. Managed perfectly, they might have been able to run up to three additional plays, either giving Browning a chance to throw for the end zone or, if nothing else, getting the ball close to the 10-yard line and putting their young kicker in a better position to succeed. Instead, there was confusion on the field after UW’s second-down run, and coaches didn’t have a play ready to call. That was the postgame explanation, anyway. And that confusion falls on the head coach, doesn’t it? And, ultimately, three consecutive “big game” losses (Penn State, Auburn, Oregon) fall on a head coach, don’t they? The Huskies felt tight and anxious in the final 30 seconds Saturday, which has mimicked the feeling in and around the program approaching these big matchups. Petersen obviously has a sterling resume in his career, built in part by slaying some “giants” of college football. And that reputation, and all that experience, makes the latest losses all the more puzzling, and the late-game strategies all the more confusing. How serious are the injuries to Myles Gaskin and Salvon Ahmed? Both running backs were injured Saturday. Gaskin appeared to re-injure a shoulder injury that popped up a week earlier at UCLA. Ahmed appeared to hyperextend his right knee in the third quarter. The good news is both were back on the field late in the game, but also very much limited. Can the Huskies bounce back?